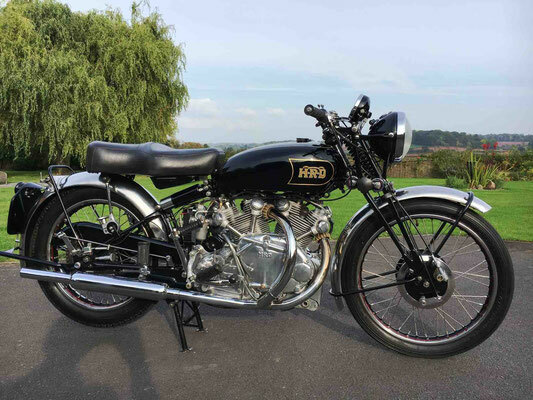 Vincent Motorcycles, "the makers of the world's fastest motorcycles", began with the purchase of HRD, less the factory premises, by Phil Vincent in 1928. HRD, was founded by the British RAF pilot, Howard Raymond Davies, who was shot down and captured by the Germans in 1917. Legend has it that it was while a prisoner of war that he conceived the idea of building his own motorcycle, and contemplated how he might achieve that. It was not until 1924 that Davies entered into partnership with E. J. Massey, trading as HRD Motors. Various models were produced, generally powered by JAP (J. A. Prestwich Industries) engines. 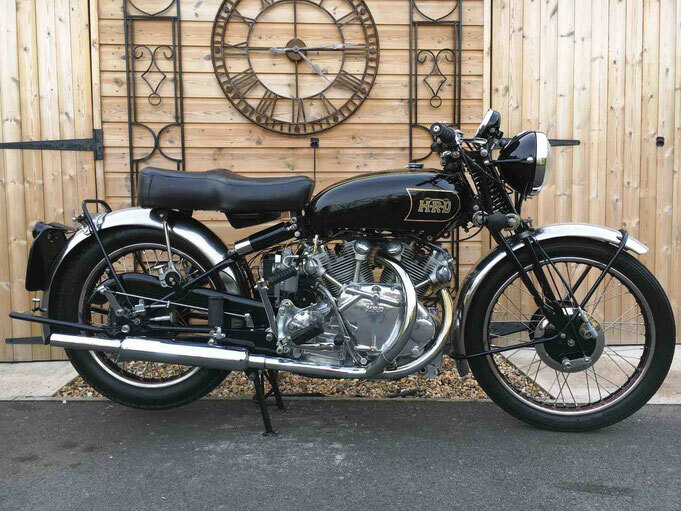 Unfortunately, even though HRD motorcycles won races the company ran at a loss, and in January 1928 it went into voluntary liquidation. The company was initially bought by Ernest Humphries of OK-Supreme for the factory space, and the HRD name, jigs, tools, patterns, and remaining components were subsequently offered for sale again. The legend has it that Philip Vincent dreamt of building a quality motorcycle bearing his own name, just as Davies had, but rather than start from scratch he wanted to start production under an established name. He had built a motorcycle of his own in 1924, and in 1928 had registered a patent for a cantilever rear suspension of his own design. 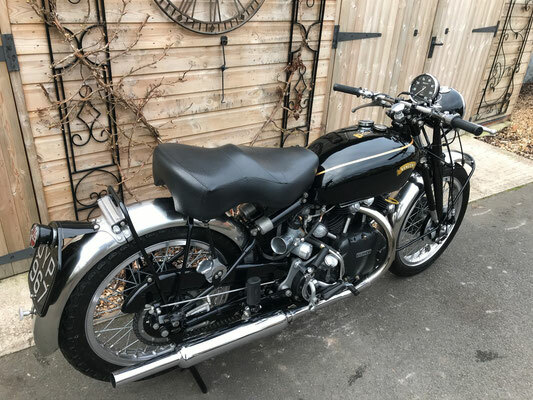 In 1928 Philip Vincent left Cambridge University with an engineering degree and, with the backing of his family wealth, acquired the trademark, goodwill and remaining components of HRD from Humphries for £500. The company was promptly renamed Vincent HRD Co and production moved to Stevenage, in Hertfordshire. 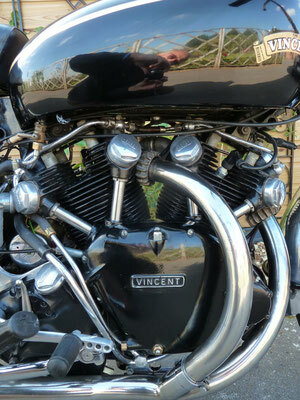 The new trademark had Vincent in very small letters above HRD in large ones. 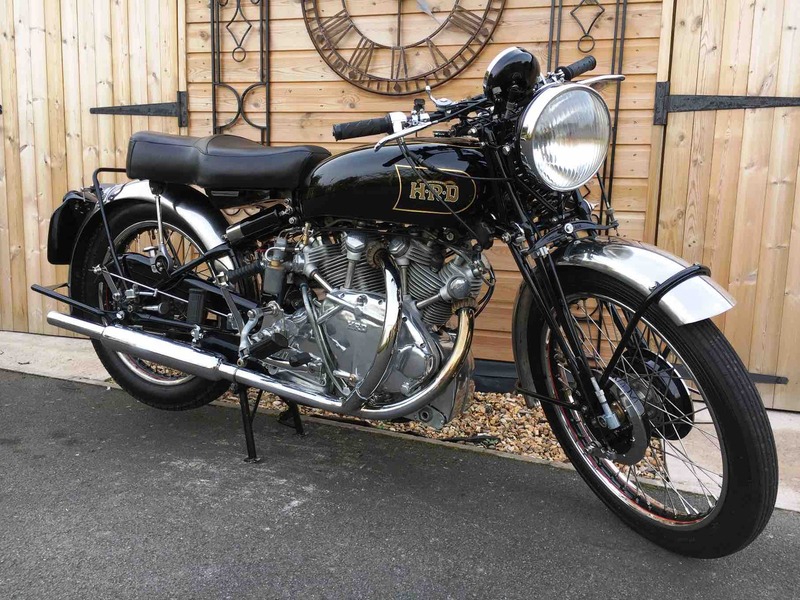 After World War II, Britain had an export drive to repay its war debts, and the USA was the largest market for motorcycles, so in 1949 the HRD was dropped from the name to avoid any confusion with the "HD" of Harley-Davidson, and the motorcycle became The Vincent. In 1929 the first Vincent-HRD motorcycle used a JAP single-cylinder engine in a Vincent-designed cantilever frame. 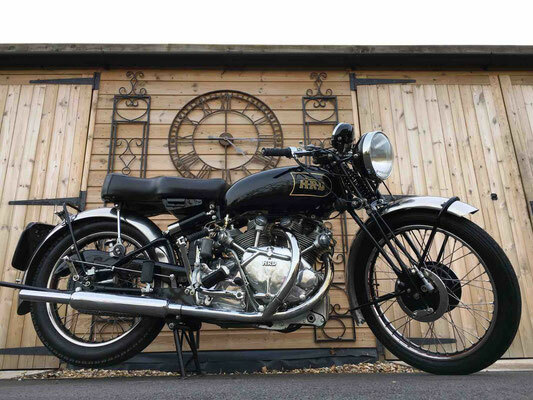 Some early bikes used Rudge Python engines. But after a disastrous 1934 Isle of Man TT, with engine problems and all three entries failing to finish, Philip Vincent (with Phil Irving) decided to build their own engines. Vincent also experimented with three-wheeled vehicles, amphibious vehicles, and automobiles. 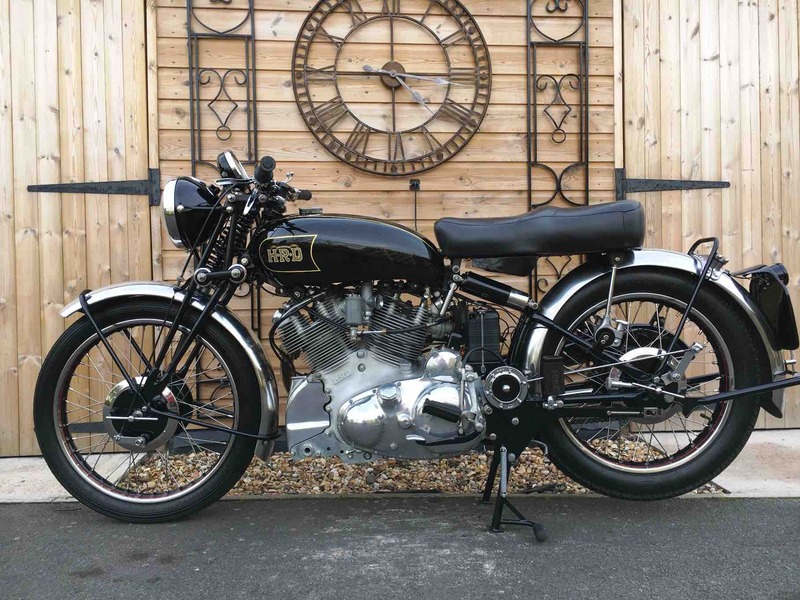 In 1932 the first 3-wheeler, the Vincent Bantam appeared, powered by a 293cc sv JAP or 250cc Villiers engine. It was a 2.5 cwt delivery van with a car seat and a steering wheel. 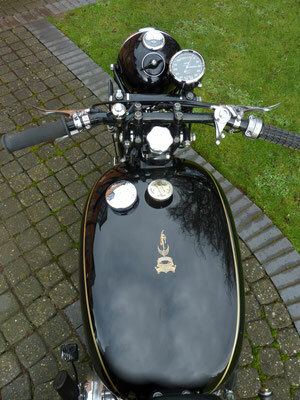 The Bantam cost £57-10-0 and the windscreen and hood option cost £5-10-0. Production ceased in 1936. 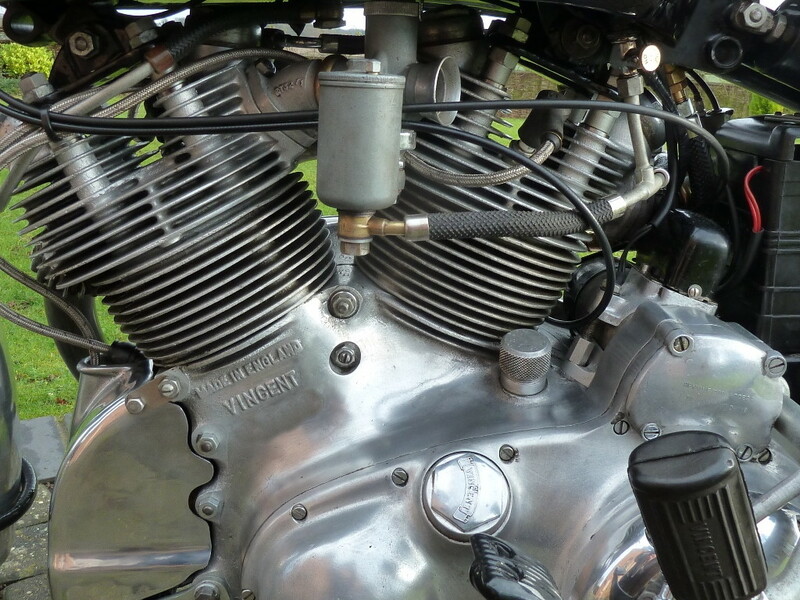 In 1931 Phil Irving joined Vincent as chief engineer. 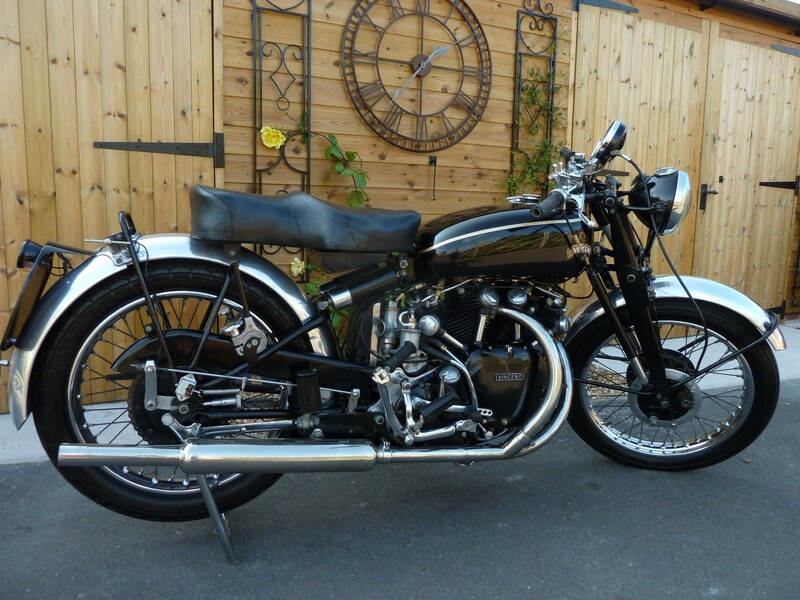 His first engine design was an OHV 500cc single-cylinder engine in 1934. The standard motor was known as the Meteor and the sports motor was the Comet; it was distinguished from earlier Vincent engines of that name by the Series-A prefix. There was a TT replica called the Comet Special, which used a bronze head. The Meteor motor produced 26bhp at 5300rpm. An unusual feature of the valve design for these motors was the double valve guides, and the attachment of the forked rocker arm to a shoulder between the guides, to eliminate side forces on the valve stem and ensure maximum valve life under racing conditions. 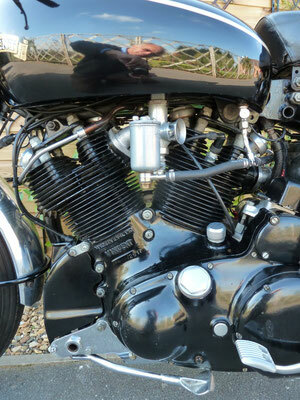 The Series-A Comet could do 90mph, but Vincent and his racing customers wanted more. 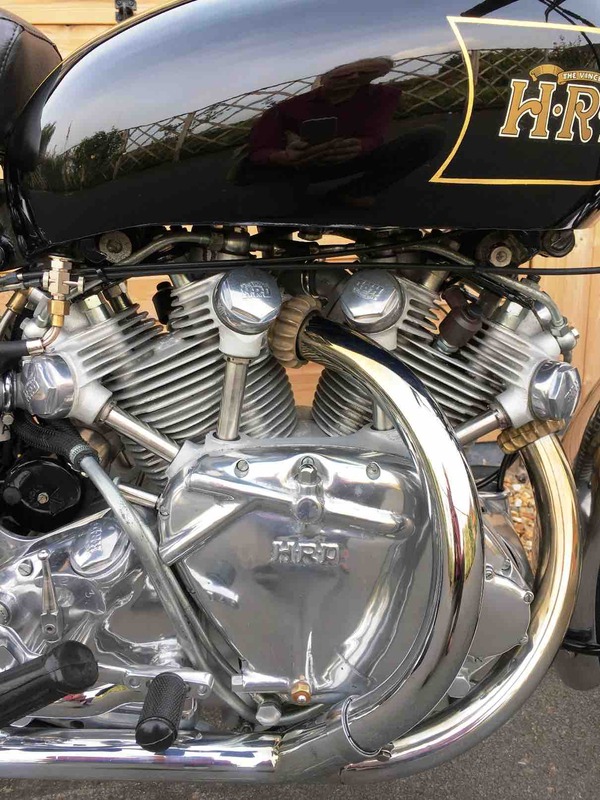 Legend has it that Irving accidentally placed a wrong side up tracing of the Vincent 500 motor on top of an equally sized drawing of the same motor in such a manner that it formed a V Twin. Moving it so that it would fit resulted in the 47.5° V twin which appeared in 1936. (The single leaned forward 23.75°.). 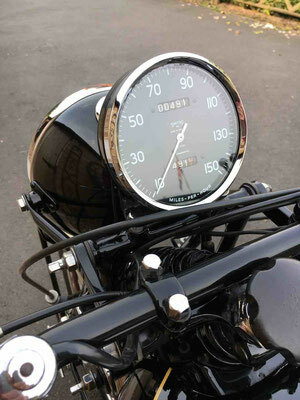 With 6.8:1 compression, it produced 45bhp. 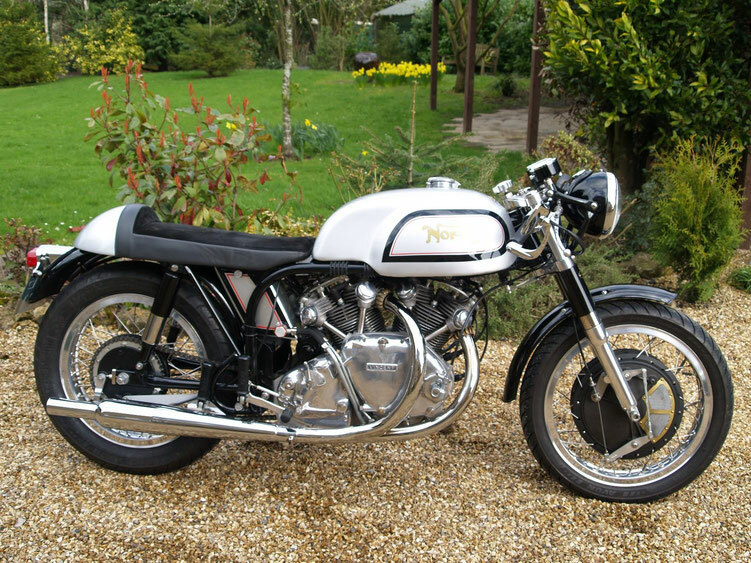 The Vincent V-twin motorcycle incorporated a number of new and innovative ideas, some of which were more successful than others. 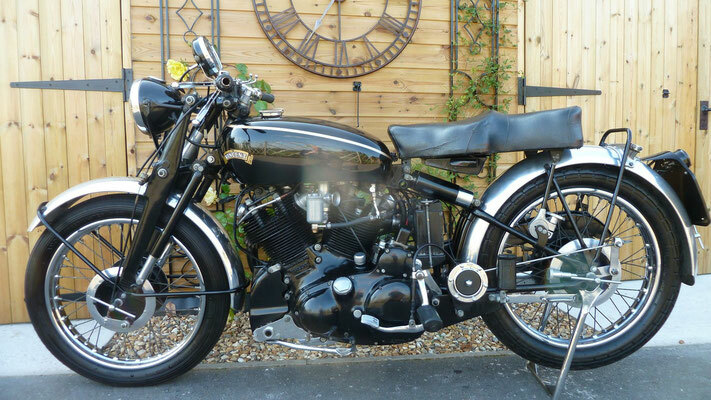 1936 The Vincent-HRD Series A Rapide was introduced in October 1936. 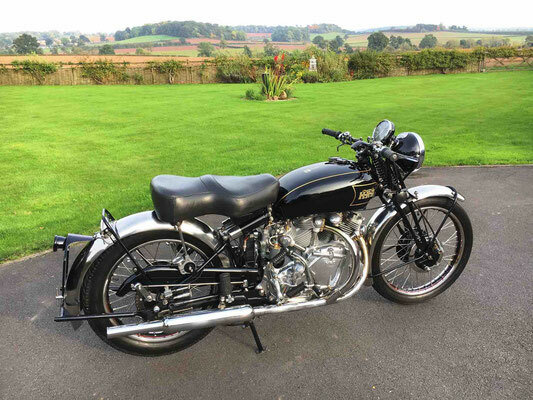 Its frame incorporated motorcycling's first "cantilever" rear suspension, which was used on all Vincents produced from 1936 through 1955. Other innovations included foot gearchange instead of hand-operated gearlever, a four-speed gearbox instead of two or three, and a side stand. 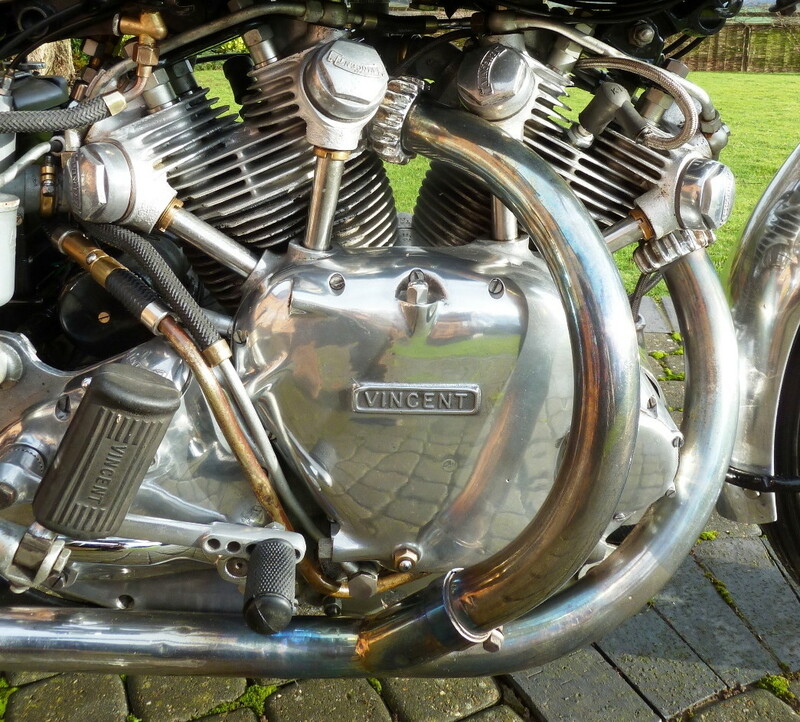 Pneumatic forks were not to be a Vincent innovation, with both Phils believing girder forks were superior at the time. The Series-A had external oil lines and a separate gearbox. The 998cc Series A Rapide Vincent cost $600, produced 45hp, and was capable of 110 miles per hour. The high horsepower meant that the gearbox and clutch did not cope well. 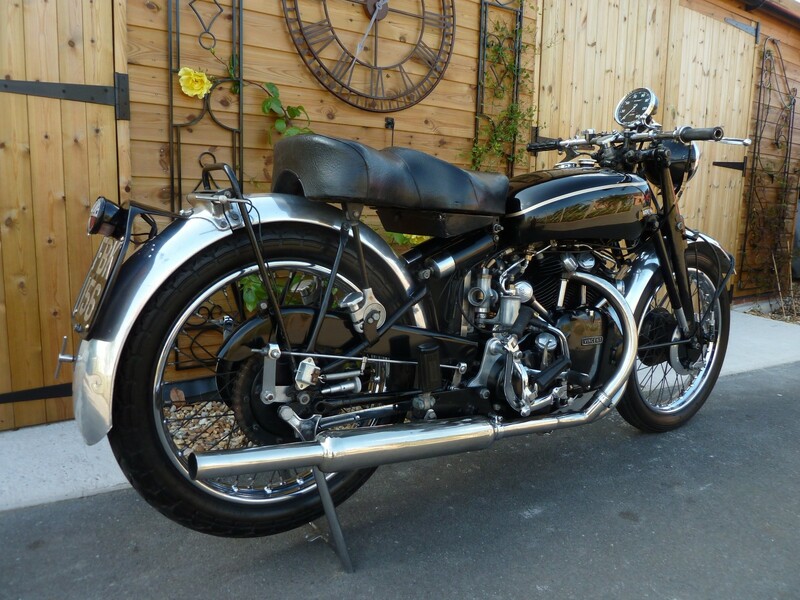 In 1937 Phil Irving went to work for Velocette but returned to Vincent Motorcycles in 1943. Vincent primarily made munitions, but Vincent engines were used in boats and portable pumps during the war, and the end of hostilities saw Vincent ready to return to motorcycle production. The Series B Rapide, designed during the war and released to the press before end of hostilities, looked radically different from the A: now the oil pipes were internal, and the gearbox was part of the engine casting (Unit Construction). 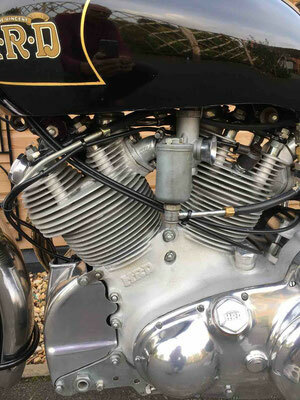 The angle between the cylinders was now 50° instead of the 47.5° of the Series A engine. 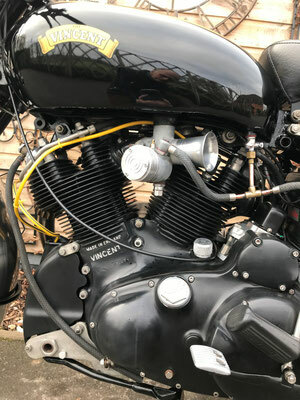 This allowed the use of the engine as a stressed member of the frame, which consisted of an oil-tank spine with the engine hanging below, and the front and rear suspension attached at the ends: Vincent called it a diamond frame. This was considered sensational at the time, and the arrangement was not seen again till the late seventies. 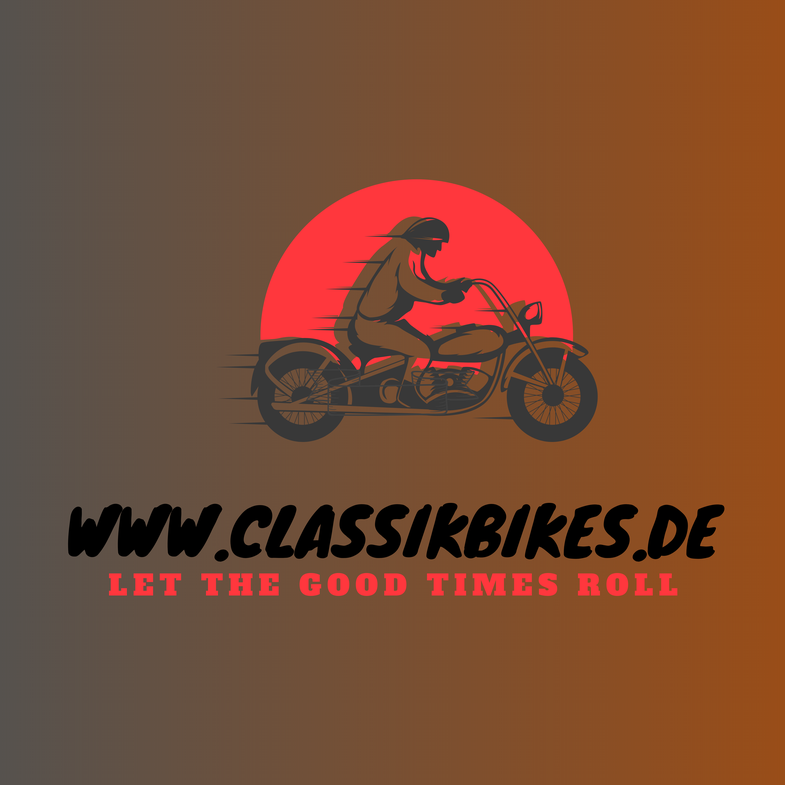 The cantilever rear became the most widely used form of rear suspension for motorcycles, and the use of the engine-gearbox unit as a stressed member became more usual. 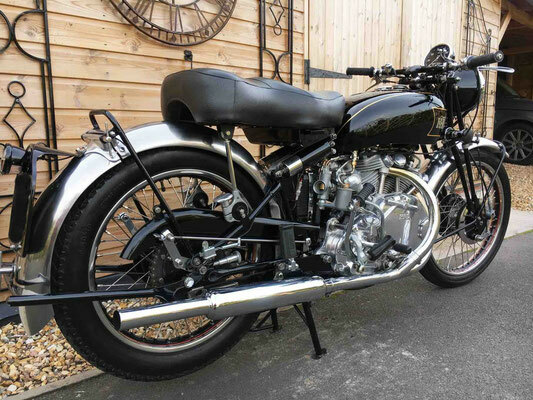 The Series B was also the first road bike to be equipped with twin carburettors. Brakes were dual single-leading shoe (SLS), front and rear. 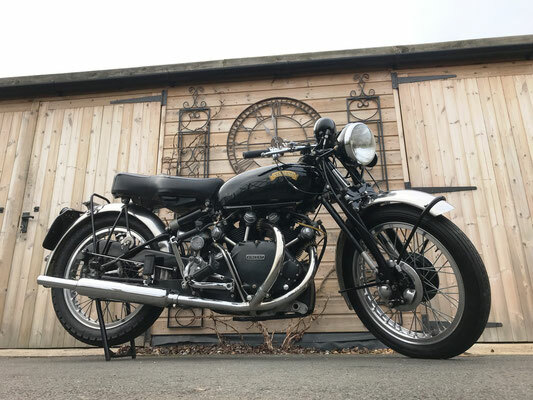 The 55.5-inch wheelbase was three inches shorter than the Series A, and its dimensions were more like a 500cc bike of the time. A more modern hydraulic shock absorber and spring assembly replaced the old twin springs and friction damper. The rear seat was supported by a sub-frame down to the rear frame pivot point, providing a semi-sprung seat with 6 inches of suspension. 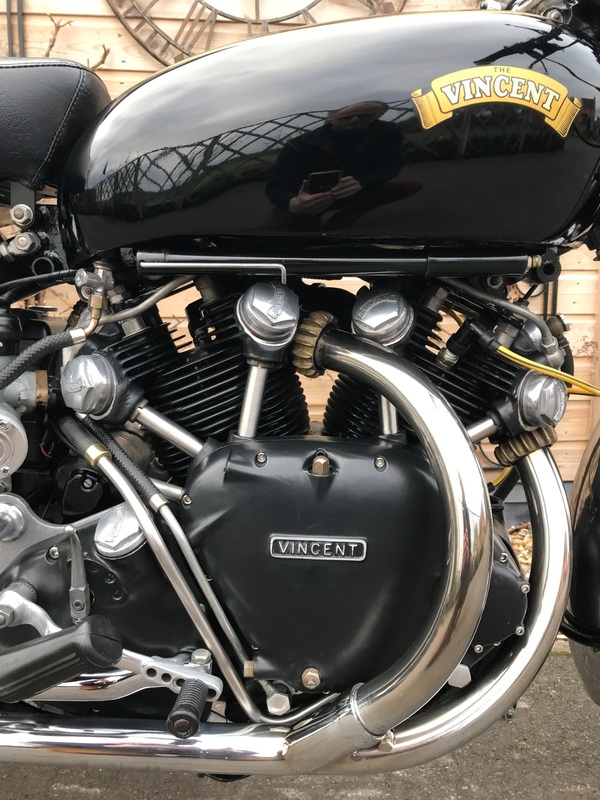 From today's perspective, it seems incongruous that Vincent could see the need for, and design, a cantilever rear suspension, as well as incorporate so many other new ideas, yet use Brampton girder forks with friction dampers up front. The two Phils felt that the telescopic forks of the time were prone to lateral flex, so they persisted with girder forks, and did use hydraulic damping in the Series C "Girdraulic" forks. 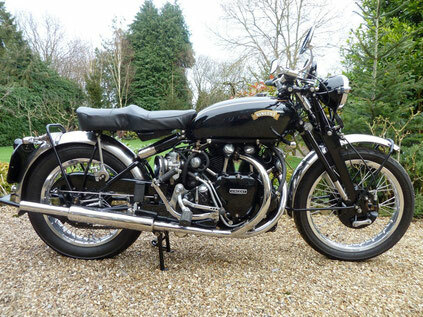 The 1948 Series C Rapide differed from the Series B in having "Girdraulic" front forks – which were girder forks with hydraulic damping. 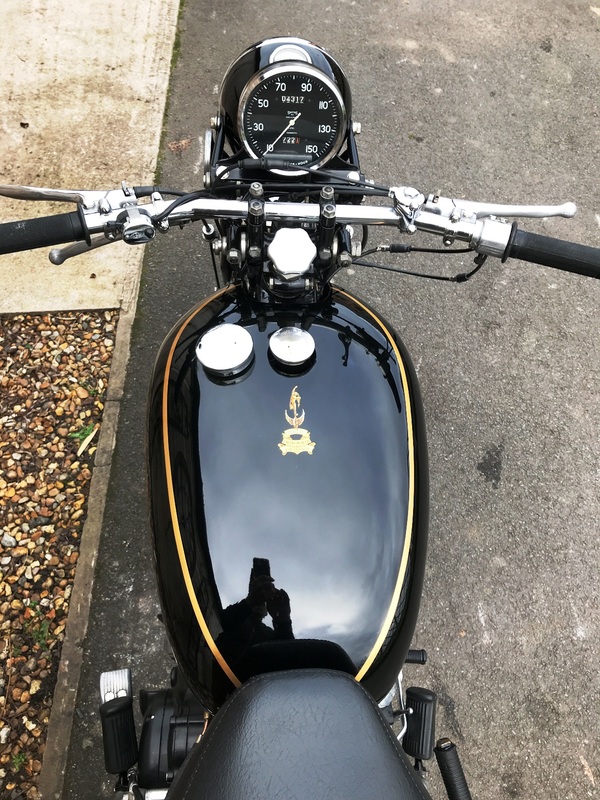 The Black Shadow, capable of 125mph, and easily recognised by its black engine and gearbox unit, and large 150mph speedometer, was introduced. 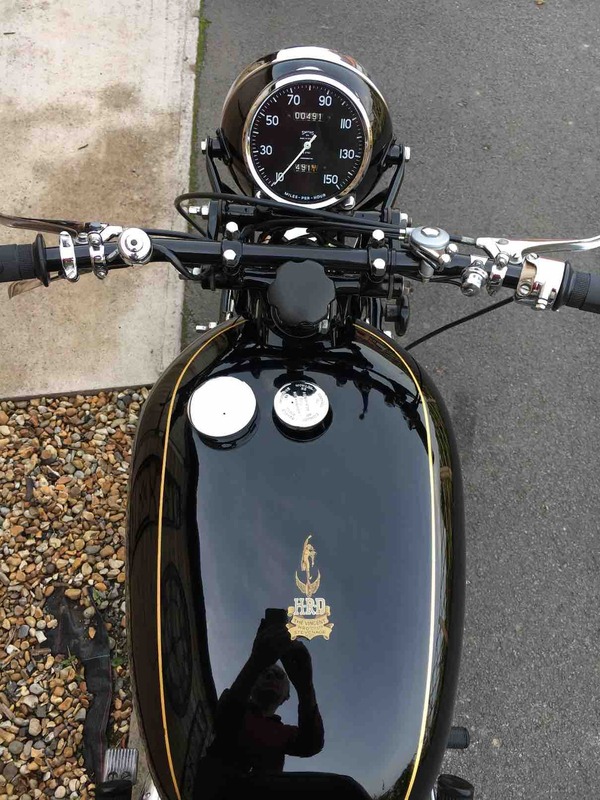 The engine produced 55bhp at 5700rpm in Black Shadow trim. The Black Lightning was a racing version of the Black Shadow, with every necessary steel part on it that could be, remade in aluminium, and anything not essential removed altogether, reducing the weight from 458lb to 380lb. Every bit the racer, it had a single racing seat and rear-set footrests. The 500cc Meteor and Comet singles were introduced, along with a 500cc racer, the Grey Flash. The Grey Flash racer used Albion gears, for the greater choice of ratios available. The 500cc bikes used a wet multiplate clutch, while the 998cc V-twins used a dry, drum-type servo clutch. In 1949 HRD, was dropped from the name, and the logo now simply said Vincent. Sales declined further after the post war motorcycling boom owing to the availability of cheaper motor cars, so not many "Series D" models were made. A growing media association between motorcycles and motorcycle gangs in the late fifties was also giving motorcycling a bad name. 1948 It was with the introduction in 1948 of the fully race-prepared Vincent Black Lightning that Vincent produced the most legendary motorcycle of its time. 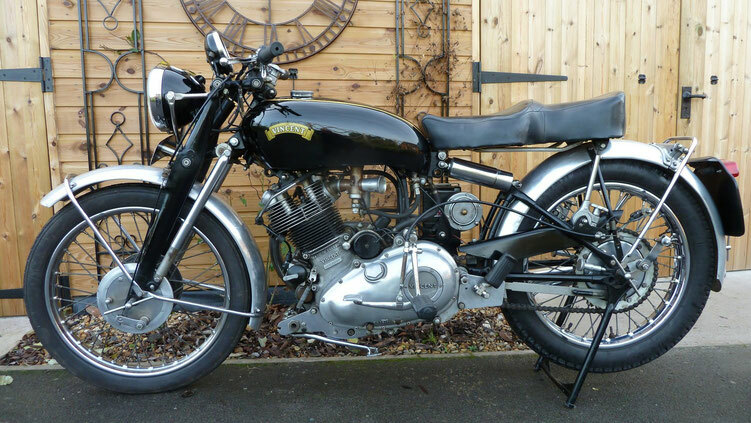 The Black Lightning was advertised as 'The World's Fastest Standard Motorcycle' - This is a fact, not a slogan! 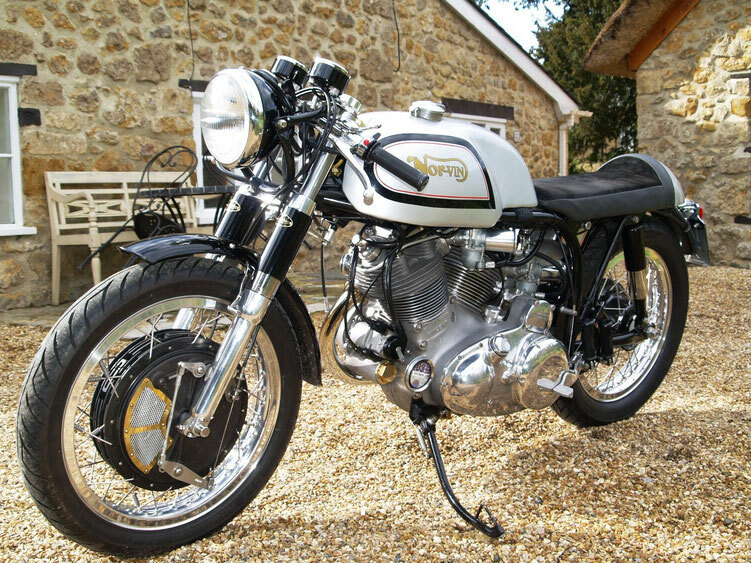 - a claim it could have made right up until the release of the 900cc Kawasaki Z1, twenty years later in 1972. (This same claim had been made in advertising before, for the earlier, fastest Vincents). 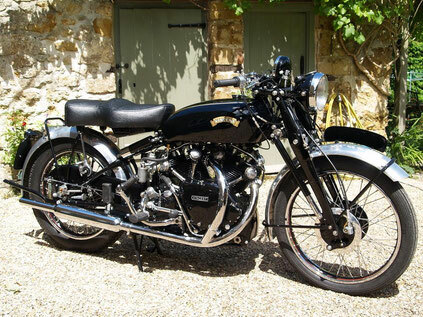 Around thirty Vincent Black Lightnings were built between 1949 and 1952. They were available on special order, selling for $1,500. 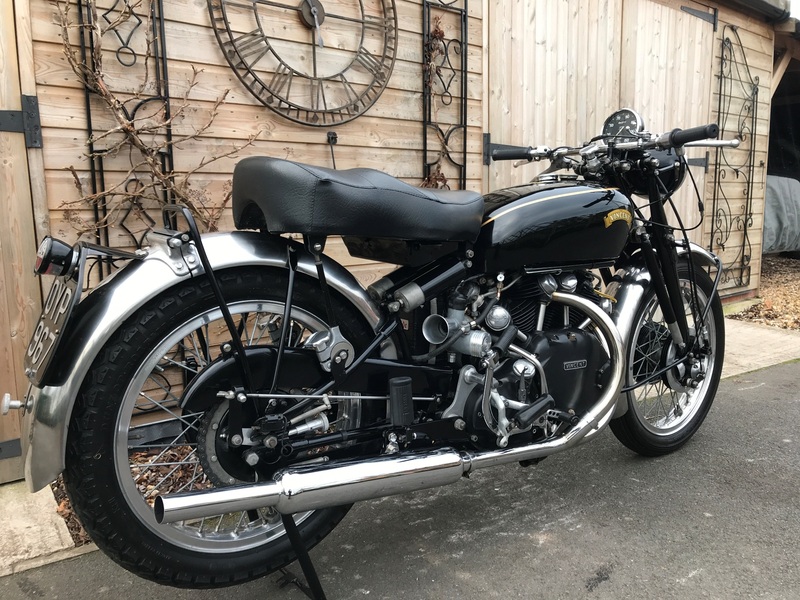 The Black Lightning had magnesium alloy brake backing plates, racing tires on lightweight alloy rims, rear-set pegs, a solo racing seat and aluminum fenders. All these helped trim the Lightning's weight to 380lb. (The Black Shadow was 458lb). The proof of the advertisement's claim came in 1948, when an Indian motorcycle dealer, Rollie Free, riding the very first Vincent-HRD Black Lightning built, raised the motorcycle speed record to 150.313mph, on Utah's Bonneville Salt Flats. Initially wearing full leathers, he could only achieve 147mph, and his leathers had been flapping so violently at that speed as to tear. He removed his riding apparel, and wearing a bathing cap, speedos, and a pair of sneakers, set out for another attempt, and set the new record. A fast car with photographer aboard followed, and took the famous "bathing suit bike" picture. 1953 Despite successful record attempts, other publicity relating to problems with the gearbox selector camplate damped America’s buying enthusiasm. A new shifting mechanism was incorporated for 1953, but the sales damage had already been done. 1954 Russell Wright set a New Zealand speed record of 140mph on a Black Lightning at the Tram Road Speed Trials. At the meeting he met Rapide owner Robert "Bob" Burns who had built a streamliner shell for a sidecar record attempt. They formed a partnership for Bob to supply a streamliner shell sidecar world record attempt. In December 1954 Bob Burns went first and set a new F.I.M. (Fédération Internationale de Motocyclisme) World Sidecar record of 157mph, up from 154mph. On the 2nd of July 1955, Russell Wright set a new F.I.M. world speed record of 185mph on the Tram Road at Swannanoa, near Christchurch, while Bob Burns upped his sidecar record to 163.06mph. 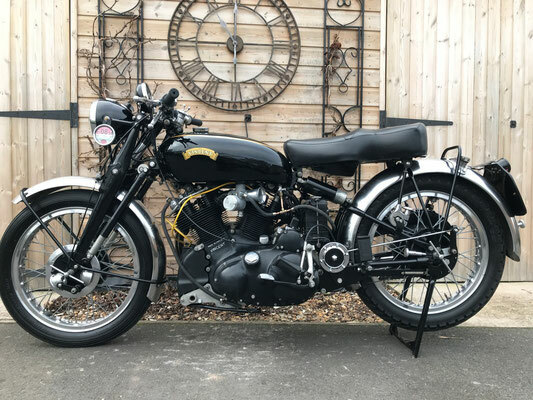 The Firefly was a 45cc "clip on" engined bicycle built from 1953 to 1955 under licence from Miller, who were suppliers of electrical components to Vincent. It was also known as the Vincent Power Cycle. 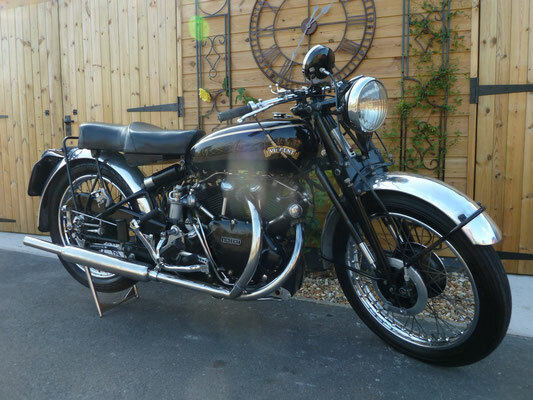 By 1954, Vincent motorcycles was in an increasingly difficult situation. In the quest for solvency, Vincent looked for ways to improve their position. The trike idea was revived. In 1932 the first 3-wheeler, the Vincent Bantam, was first introduced. Powered by a 293cc sv JAP or 250cc Villiers engine, it was a 2.5cwt delivery van which used a car seat and steering wheel rather than the standard motorcycle saddle and handlebars. 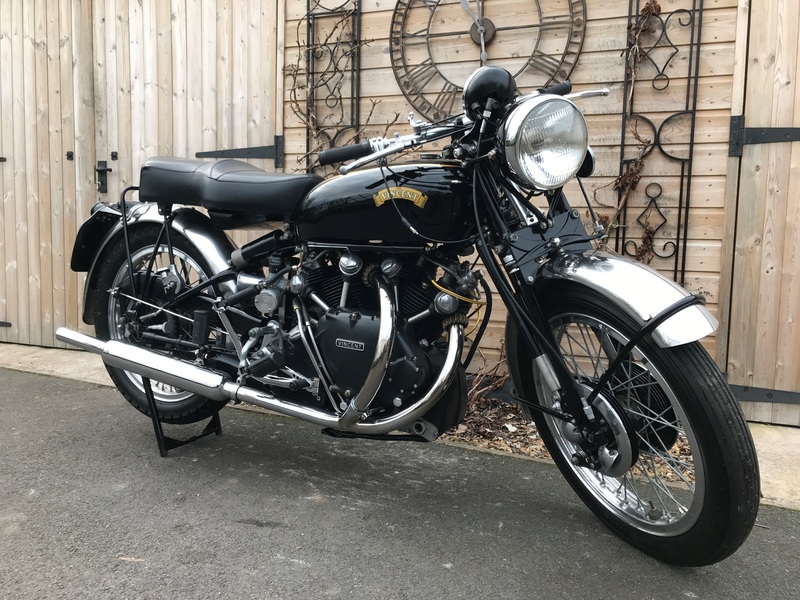 The Bantam was priced at £57-10-0 and a windscreen and hood for an additional £5-10-0, ceased production 1936 – the first year of the Series A motorcycle. In 1954/1955, due to falling sales of motorcycles, a one off prototype 3-wheeler powered by a Vincent Rapide 998cc engine was unofficially named Polyphemus. To keep development and production costs low, it used a parts bin-approach, including pieces from Vincent motorcycles, as well as wheels came from a Morris Minor and a body based on the materials used in the Black Knight/Prince. With the standard Rapide engine the Polyphemus could reach 90mph, and reached 117mph with a Black Lightning engine in 1955. 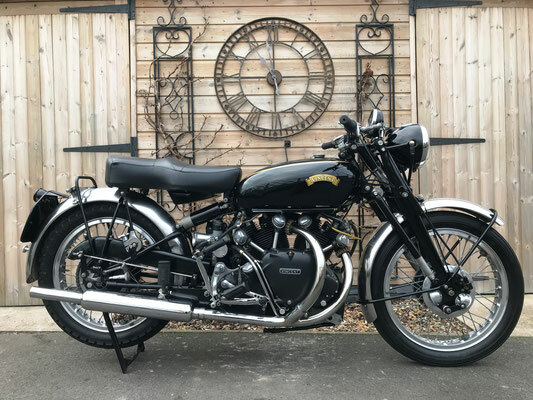 After several more prototypes, the then named Vincent 3-wheeler was offered to the public in 1955 at £500 – a high price for any vehicle of the time (the BMC Mini launched six years later for £100), especially for a vehicle with no reverse gear, self starter or hood. Vincent sold none. Vincent motorcycles were hand built and expensive - only a total of 11,000 machines were sold post-World War II. A sales slump in 1954 forced the company to manufacture NSU mopeds. 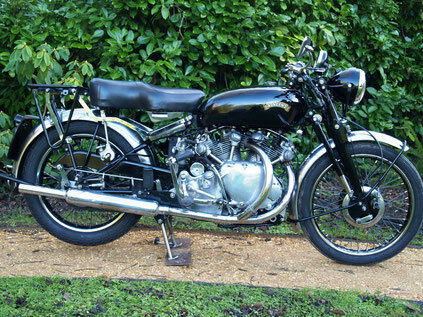 Only forty of the two-stroke 1955 NSU-Vincent Fox 123cc were built. 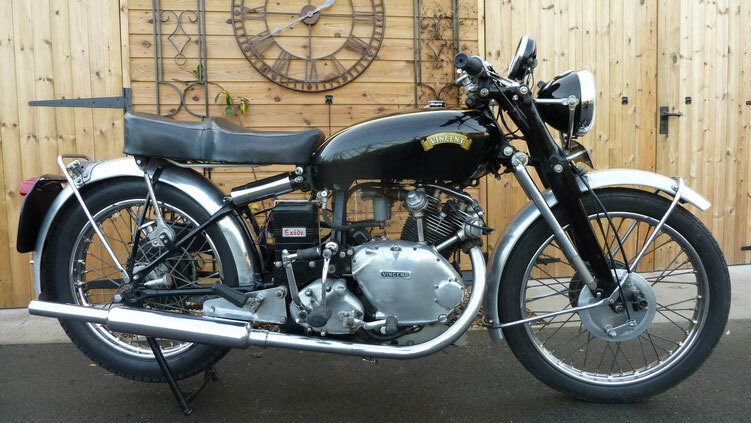 There was also an ohv four-stroke NSU-Vincent 98cc, and Vincent also sold the NSU Quickly moped; too well it appears (selling about 20,000 in one year – a foot note to how the market had changed again), as NSU took control of its own sales after a year. 1955 At a Vincent Owners' Club dinner in the summer of 1955, Phil Vincent announced that the company could no longer continue in the face of heavy losses and that production of motorcycles would cease almost immediately. 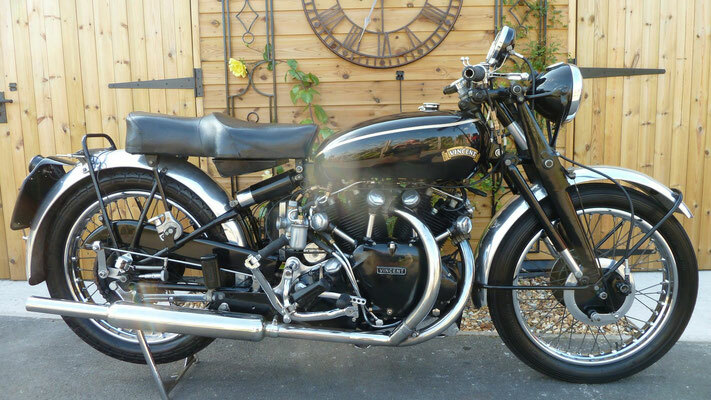 In 1955, one week before Christmas, the last Vincent came off the production line and was promptly labeled The Last. The factory then turned to general engineering, the manufacture of industrial engines, and there was the Amanda water scooter, possibly the first personal watercraft. A Vincent engineer lost his life testing it, drowning at sea. Vincent tried for a government contract supplying motors for the ML Aviation U120D target aircraft. The motor had to be capable of passing prolonged full power operation tests. This was called the Picador project. 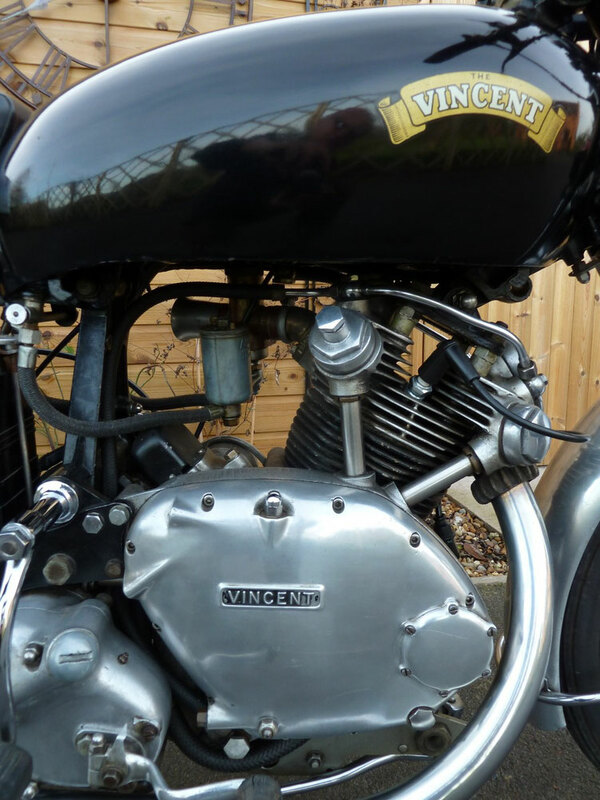 The Vincent motor was upgraded with a better crankshaft, Scintilla magneto, double speed oil pump and fuel injection. They did not get a contract. 1959 The company went into receivership in 1959. It has since been bought and sold by other engineering firms. 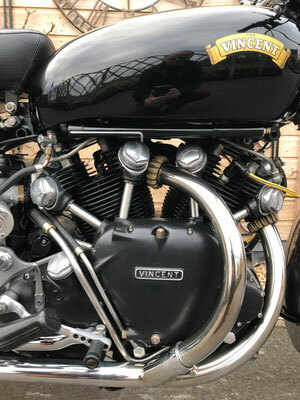 In 1955 Phil Vincent declared that Vincent parts would always be available and indeed they are still available, through the Vincent Owners' Club, Vin Parts International and other sources.